-With the overtime loss, Los Angeles finished with a record of 39-35-8. Excluding the 2012-13 season, which was shortened by the work stoppage, their 86 points is the lowest total since they recorded 79 with a 34-37-11 record in 2008-09. -With the overtime loss, the Kings fell to 58-49-25 all-time against the Ducks, a record that includes a road mark of 23-30-13. Anaheim has won 14 of the teams’ last 20 regular season meetings, while 13 of the last 19 games in the rivalry have been decided by one goal. L.A. finished the regular season series with a 2-2-1 record against the Ducks, going 1-1-0 at Staples Center and 1-1-1 at Honda Center. -Los Angeles finished 24-20-6 against the Western Conference, 12-14-3 against the Pacific Division, 19-13-8 in one-goal games, 18-30-3 when their opponent scores first, 13-13-3 when tied after one period, 13-3-5 when tied after two periods and 8-8-3 when outshot by their opponent. -The Kings fell to 24-7 since the implementation of three-on-three overtime. In addition to Shea Theodoer, overtime game-winners from the opposition were scored by Ryan O’Reilly, John Moore, Jaden Schwartz, Esa Lindell, Mikael Granlund and TJ Brodie. -With his assist on Dustin Brown’s goal, Jarome Iginla recorded the 1,300th point of his career (625-675=1,300). -Players to appear in all 82 games for Los Angeles were Jake Muzzin, Drew Doughty, Trevor Lewis, Derek Forbort, Alec Martinez and Jeff Carter. Doughty ends his season having played in 244 straight games, while Muzzin ended his season having played in 238 straight. The franchise record is 330, set between March 21, 2007 and March 26, 2011 by Anze Kopitar. 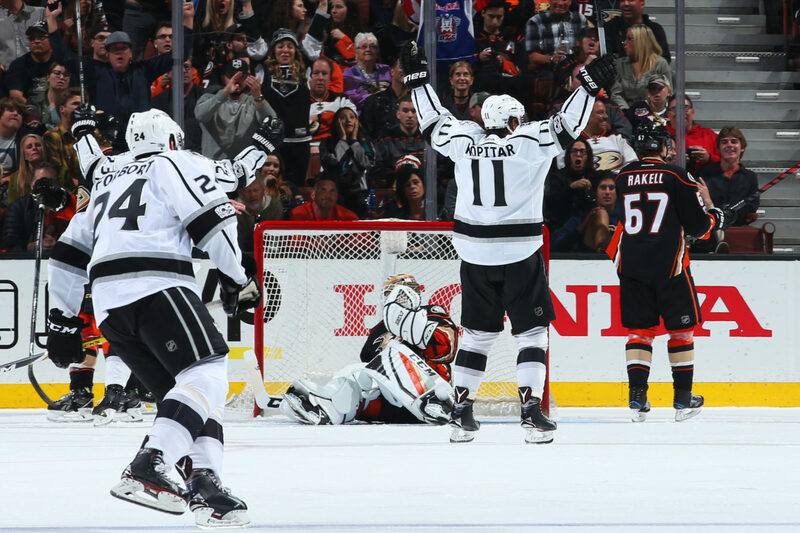 -Jeff Carter led the team with 32 goals and 66 points. It was the first year since Michael Cammalleri totaled 80 points (34-36=80) in 2006-07 that Anze Kopitar did not lead the team in scoring. Kopitar led the team with 40 assists. -The Kings attempted 50 shots (18 on goal, 15 blocked, 17 missed). The Ducks attempted 60 shots (24 on goal, 15 blocked, 21 missed). Drew Doughty finished with a game-high four shots on goal. The Pearson-Carter-Toffoli line was held without a shot on goal. -Los Angeles won 28-of-59 faceoffs (47%). Among regular participants, Anze Kopitar won 12-of-22, Andy Andreoff won 3-of-4, Nick Shore won 7-of-10, Nic Dowd won 2-of-6 and Jeff Carter won 4-of-16. The 2016-17 season is over. Final media availability will take place at a time to be determined this week.